In an effort to become healthier, I, like so many other consumers, have been reading labels. Hydrogenated oils, high fructose corn syrup, and saturated fats are all ingredients that I try to avoid. One of the biggest challenges as been with one of my favorite foods: peanut butter. I have it on toast every morning, so I want it to be the best it can be, and we have gone through many brands and styles, from creamy to chunky. 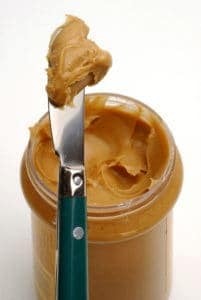 My mother always bought Skippy, but when I grew up and became a mom myself, I experimented with Jif (because I’m a choosy mother), then Peter Pan (because I’m one of the picky people). But soon, I realized that added sugars, hydrogenated oils, and salt, although tasty, were not landmarks on the road to healthy. So, I began to experiment with the “natural” peanut butters, going so far as to make my own, first in a peanut butter maker that a neighbor gave us, then in the food processor (both very noisy endeavors). For a long time we’ve been using Smucker’s because it is available at a decent price at BJ’s and, because with a name like Smucker’s … (Do I come across as vulnerable to jingles?). I love the taste and the texture. However, I hate having to stir it as the bottom of the jar is very dense. At one point I went so far as to buy a tzatchke from the internet that screws onto the jar like a regular lid but has a stirrer attached. It worked okay, but the rubber lining disintegrated in less than a year. Desperate, I then devised a hack to homogenize the Smucker’s: I turn the jar over for 24 hours, then stir and place in the fridge to keep its consistency. But isn’t that a lot of work? So, back to the drawing board with Trader Joe’s peanut butter (runny and not good flavor). At a son’s house we sampled the Whole Foods variety — delicious — but , alas, we don’t have a Whole Foods nearby. Then we went to visit our daughter and her family in Vermont. They had Teddie, a brand I had bought years ago and liked but had totally forgotten about (after all, BJ’s doesn’t carry it). Elana claimed that, although the label says to stir, it really didn’t need to be either stirred. So, Teddie is the all-round winner, although I do put it into the refrigerator to keep it at the right consistency. All this thinking about peanut butter has made me hungry. Excuse me while I go make myself a sandwich.